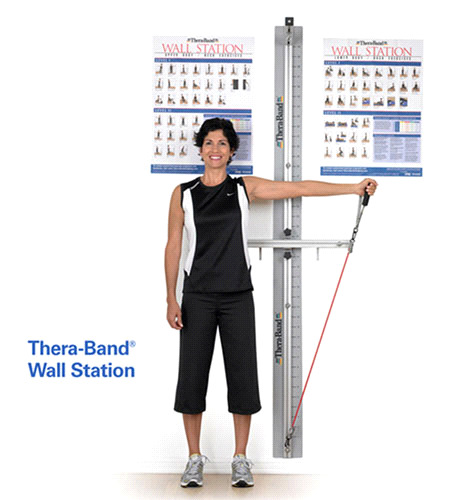 Thera-Band Professional Exercise Rehab Wall Station. 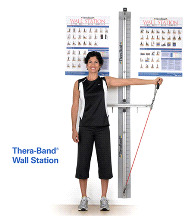 The new THERA-BAND® Wall Station is the first compact, total body rehabilitation system designed for in-clinic strength training, and it features the familiar colors and resistance levels of THERA-BAND clip-connect tubing. This comprehensive rehabilitation system for upper and lower extremities features a multidimensional design with three planes of movement to teach patients the same proven THERA-BAND system of progression they will use at home. The system also provides a comprehensive accessory package including soft grip handles, extremity straps, and head strap. **THIS PRODUCT HAS A 4 WEEK LEAD TIME** If you have any questions about this product please call (800)355-2956.